Building a Values-Based Company with James Archer and Blake Gage I the GIG at Belmont University campus in Nashville, Tennessee, September 26, 2018. From the oil fields of Texas to an entertainment company on Music Row, convocation speaker James Archer shared his commitment to the values-based leadership that defines his diverse career. 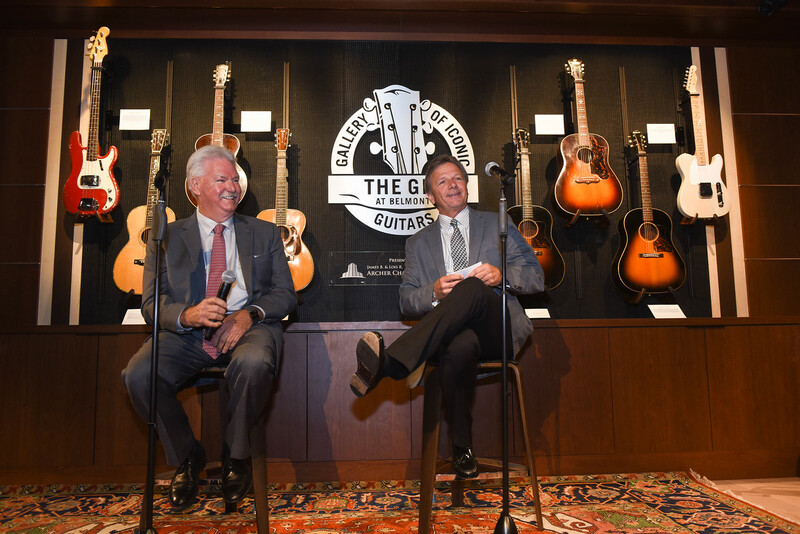 Archer, president/CEO of oil and gas operator KJ Energy as well as CEO of Nashville-based MV2 Entertainment, was interviewed Wednesday in the Gallery of Iconic Guitars (The GIG) by his longtime friend and associate Blake Gage, who serves as vice president of corporate development for KJ Energy. To a packed house of students, faculty and staff, Gage recounted how Archer and his wife Lois began their Multi-Chem business in their garage in 1993. When the company was sold to Halliburton in 2011, it represented the third largest production chemical company in the world and a $365-million-a-year firm. Still entrenched in the oil and gas business, Archer has since expanded his reach into new arenas with the launch of MV2 Entertainment and JL Bar Ranch and Resort. Gage opened the convo asking the Texas native to expound on the foundational pieces that enabled his long-term success. For Archer, at the center of all his work is the concept of values-based leadership, creating a four-part model that serves as the foundation for everything his company does. “Ethics, commitment, excellence and innovation. It’s always about doing the right thing for all of your stakeholders. You treat everyone the same, the way you want to be treated.